I saw the Pope today. Pope Francis to be exact. 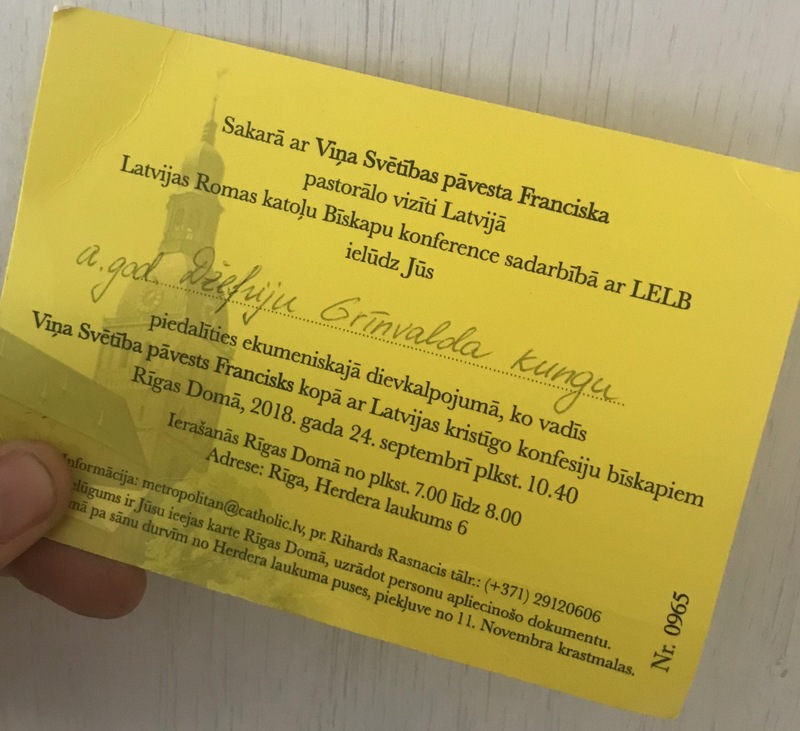 Rita got on some list and we managed to score tickets to the Riga Dome Cathedral service starring Pope Francis himself. It was pretty cool. In fact, it was BlogPostCool™. I remember when I was quite young, and I saw news stories of Pope something or other visiting the United States and how there were flocks of people who went to see him. I think some of my distant cousins went and talked about it for months. Not being a Catholic, I was never really into the whole Pope thing, but I happen to think that Francis seems like a pretty cool person even without the whole pope stigma. Am I being sacrilegious (it took me 3 minutes to finally spell that word right… why wouldn’t it have “religious” in it? Seriously Websters!!!)? I never know if I go to far with the questions about faith and religion. Once, as the editor of one a school paper, one of my students posted an Onion-esque article about the Popemobile being a monster truck. There was a poorly photoshopped photo of his eminence driving and crushing cars in the truck, and plenty of complaints followed. I had no idea that this was something you couldn’t do in small town America. I had grown up an ELCA Lutheran. I thought everything was just kind of okay. So I apologize in advance if I do not get it. 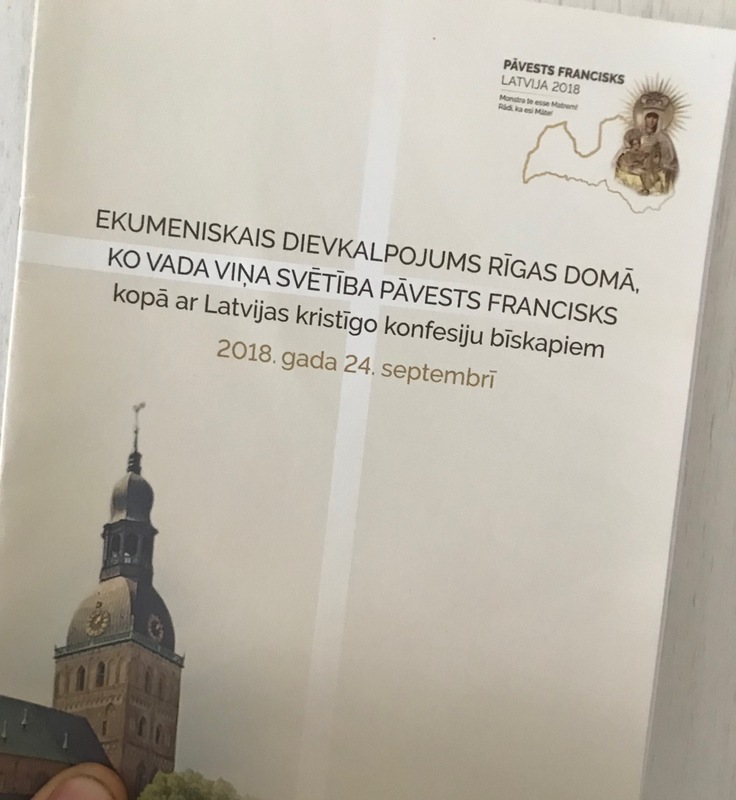 In Latvia, Pope Day 2018(as it has come to be called, at least by me) is a national holiday. Yes, the entire nation gets the day off for the Papal visit (also excuse my random capitalization, I am just assuming important stuff should be capitalized). So a day off was the good news, but the sad news was that when we checked our invitations we found that despite the fact that his sermon would not be until 10:40, we had to be at the church before 8 a.m. After returning late from a trip to Smiltene and dropping off the rental car at 7 a.m., we had to book it on our bikes to Old Town to get in the queue for entry. We made it, thank God, and it didn’t rain on us. Speaking of rain, one thing I have to say about Latvia’s weather is that it is kind of like clockwork. September 22 showed up, and the weather switched like a light. It was sunny and summer-like one day, and then the next, it was windy and chilly. Instant Autumn! On our drive through the rainy Latvian countryside, we could see the leaves changing and the true beauty of the season manifest itself as we observed. It was lovely! Rainy, but lovely. With our yellow invitations and passports in our pockets, we proceeded to the biggest church in Riga, the Dome Cathedral which is over 800 years old. We stood in three lines. The first was just to get to the main line where the man just looked at our yellow invitation and let us in. Then came the second queue where a man and woman checked both the invitation and the passport. The final line was the longest and slowest where we had to go through a security check including a lady with a metal detector. In addition to these security checks, there were hundreds of bright-yellow vested police officers all over the city. In the last line, we were accompanied by RDKS the Riga Cathedral Girls’ Choir who were ready to sing for the Pope. 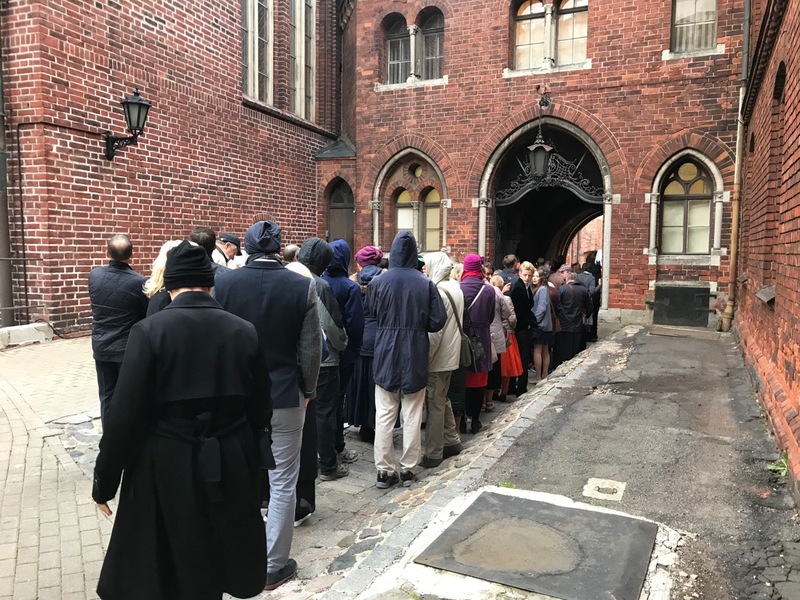 After finally making it through the last line, we were able to find seats, but I have still not been inside the Riga Dome Cathedral with a view of the altar. I am not sure, at this point, if there really is an altar. I think it is just one big room with giant columns that block the view so completely from any other part of the church that everyone just thinks they are missing the show, when the truth is that there is no show. This is just a theory, of course. Rita was smart and she brought a book to read. I did some writing and internet surfing as we waited about an hour-and-a-half for Francis to show. 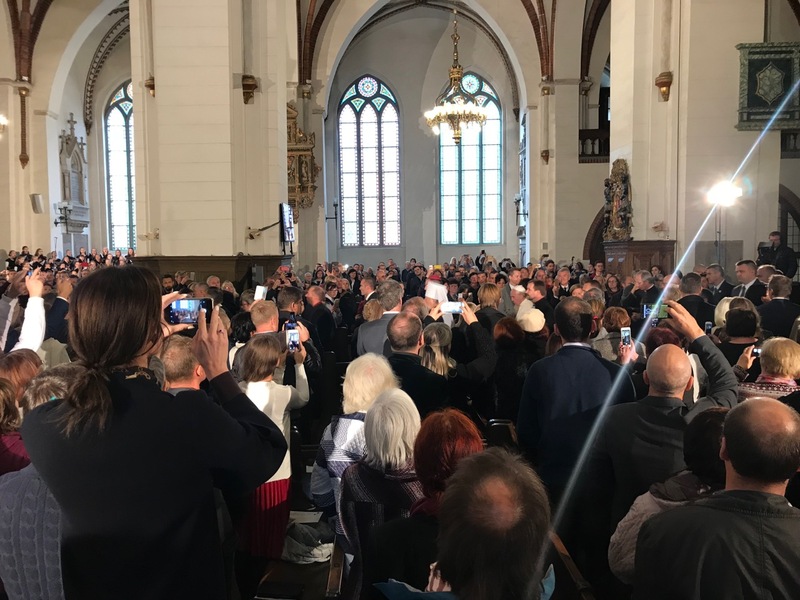 Luckily, they rigged up screens all over the church, so we could watch him live as he presented flowers at the Riga Freedom Monument and spoke the Presidential Palace. We even got to watch him ride in his black Fiat (not the white Popemobile) through Old Town toward the church. That was kind of cool. At one point, I could just tell that President Vējonis wanted to hold the Pope’s hand, and sure enough, as the Pope stepped down the steps at the Freedom Monument, Vējonis took his hand and helped him. It was adorable. I felt really bad for one reporter standing outside the church in the rain waiting for the Pope to arrive. The camera apparently cut to him without telling him, and he was doing his vocal warm-up exercises on live TV in front of thousands of viewers. Poor guy, but maybe he will make some outtake reel somewhere. Watch for the funny Latvian holding the white umbrella! Anticipation rose in the cathedral as Francis exited his Hyundai and entered. We had to stand there and wait awhile while everyone got everything situated. There was a lot of situating to do on this day for a lot of people. All the big priests, cardinals, bishops and archbishops were decked out and ready to stand or sit wherever they needed to be. Cameramen and dignitaries all shuffled in and out. I kind of wished that everyone could just top being so nervous about everything for a few minutes to actually pay attention to the message. I think we often get so caught up in all the little details that we forget that the Pope is here to give a sermon, and he represents something much bigger than all of this little stuff. So let us pay attention. If only for ten minutes! 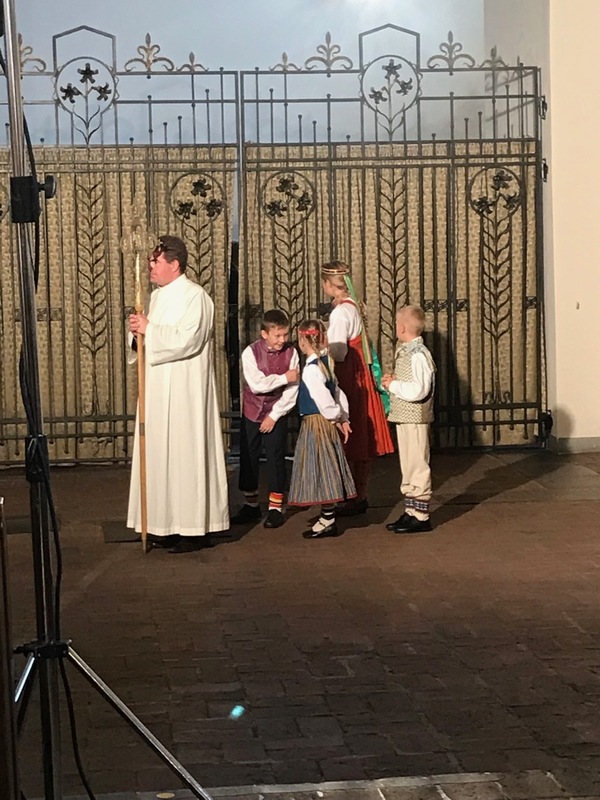 The girls’ choir sang as his Eminence entered, escorted by a bunch of important people and four adorably dressed Latvian kids in folk costumes. We could barely see him, and everyone had their phones out trying to snap a photo. It was a nice, snappy service with not much pomp and circumstance. The girls’ did a lovely rendition of Hallelujah, just singing the word “hallelujah” over and over until they crescendoed at an impossibly high pitch in some beautiful harmony. As their voices echoed over the stones of the ancient church, I wondered how many notes these walls had sustained? The thundering organ played a few songs, and finally, Pope Francis gave his sermon. It was, of course, in Italian. The t.v. screens included Latvian subtitles, and luckily, there was a nice priest walking around handing out English translations. I read the speech as he spoke, and it was a very nice message. He pointed out that this Cathedral was over 800 years old, and that the organ is one of the oldest and largest in Europe. He used the organ as a metaphor for the gospel saying that the gospel, like the organ, should not just be a part of history but be able to thrill and bring joy to people even today. I liked the message overall. It was one of hope and a call for the church to not be stuck in the past, but to look to the present and future with the Gospel as guidance, but not to stay stuck in the history of Christianity. It is also a hopeful message for a secular Latvia. History is important, but you cannot get so lost in your history that you lose track of the incredible forces that shape the present. With a big election coming up, I think this message resonated. 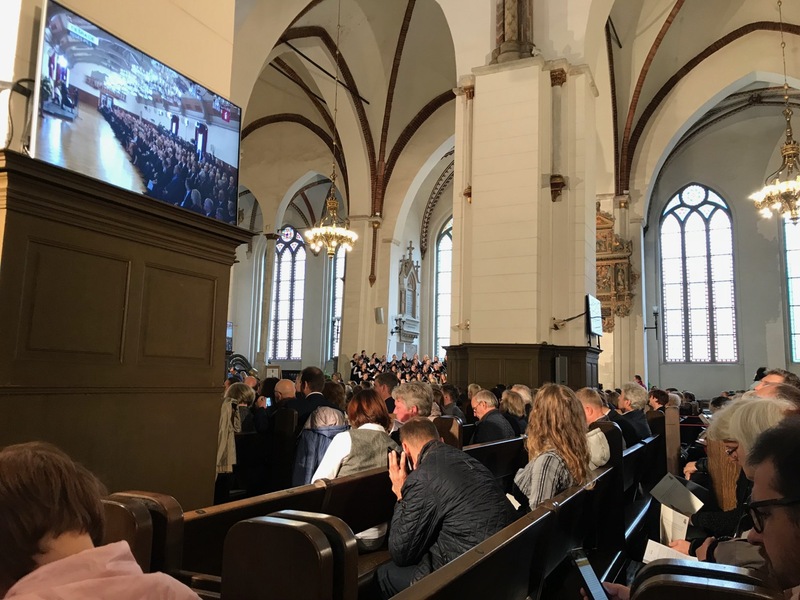 He preached ecumenism, the promotion of unity between all Christian churches, standing side by side with Lutheran, Baptist, and Russian Orthodox bishops each presenting a part of the service. There was no mass, just some more singing and prayers. And at the end of it all, as we sat there waiting for all the important people to leave, the crowd of about a thousand people just broke into spontaneous singing. “Laudate, omnes gentes” was the song. It was lovely.